It didn't take too many minutes into our first dive to realize we had another Cladophora bloom happening here at Honokowai. Our dive site has been victim to three such blooms, the ones in 1989 and 91 being the most virulent. 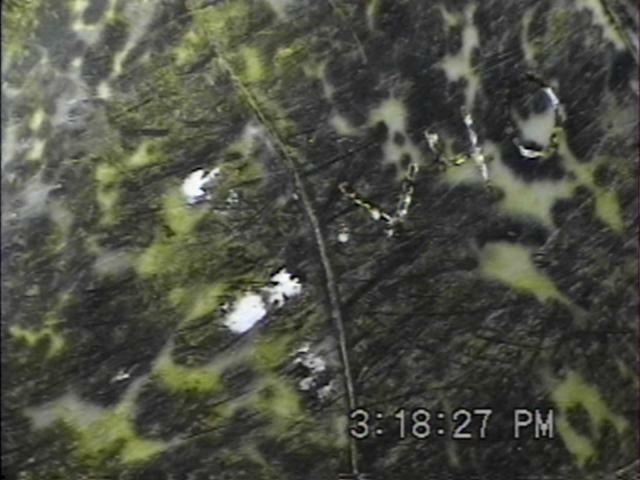 We've been tracking the algae, and it is following the same pattern of growth it did in previous years. It is certainly as bad as it was in 1989, but hasn't yet reached 91 standards. Algae covers the reefs everywhere from 25 to 40 foot depths. As expected (though the reasons are unknown to us) the southern reef has less growth than those reefs to the north. Still, this is only early July and the Cladophora has all summer to do its dirt. It too is now dead and choked with algae. At our dive site we had four large Pocillopora eydouxi, often called elkhorn locally. 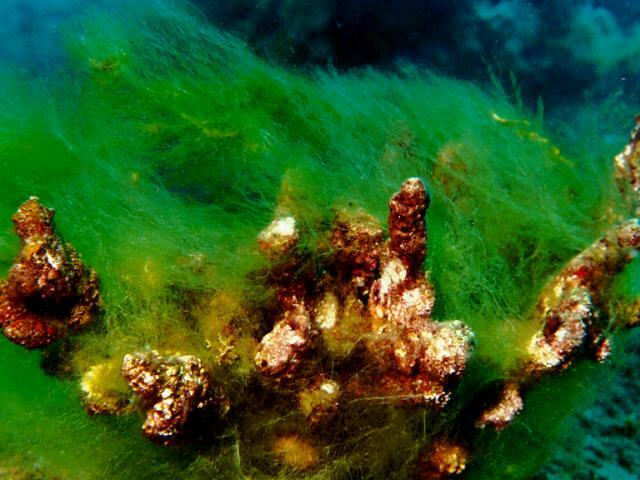 Three of these underwater landmarks were smothered and killed by the previous algae blooms. Only one had survived up to last summer. It too is now dead and choked with algae. We knew it could not survive another bloom. What effect this bloom will have on the turtles is anyone's guess. We do know, however, the turtles eat Cladophora because we observed one doing just that this week. Sadly, each day so far we've seen a small turtle resting in a mat of Cladophora in 12 feet of water. Meanwhile, the hooked red hypnea (Hypnea musciformis) still piles up on our beach, making entry and exit most unpleasant. We will be monitoring both types of plants carefully throughout the summer. We did not see Tiamat at all in 1997. We really weren't surprised and it caused us no special worry. After all, Tiamat's condition had improved immensely and she was clearly winning her battle with FP. Since 1992, we had sighted Tiamat regularly at Honokowai--every summer. There's a problem with Tiamat however. Ti's a "new nester". She has no tags and so we must wait till the Summer of 1998 when, if the fates are kind, Ti will have returned from her long migration sporting shiny new tags. We are confident that in 1998 we will read those tags and be able to report to you that Tiamat was at the FFS in 1997. Hawaiian green sea turtles are that reliable. Tiamat was back at her favourite resting place and it didn't take long to resight her. She was indeed wearing shiny new tags, confirming where she was last summer. She sports tags 122C on her left hind flipper and 123C on her right hind flipper. More exciting, she has "V 40" boldly engraved in the right hind portion of her carapace. She has "V 40" boldly engraved in the right hind portion of her carapace. George Balazs of the National Marine Fisheries Service in Honolulu initiated the sea turtle tagging programme at the French Frigate Shoals (FFS) on June 1, 1973. Tiamat's presence at East Island last summer put her there exactly during the 25th tagging season. As a result, she is now a really special turtle to us. In 1994, when George Balazs went diving at Honokowai, he met Tiamat. She was very sick with fibropapilloma disease. By 1996, she was experiencing regression. Clearly, by 1997 she was healthy enough to make the long migration to the French Frigate Shoals to lay her eggs. 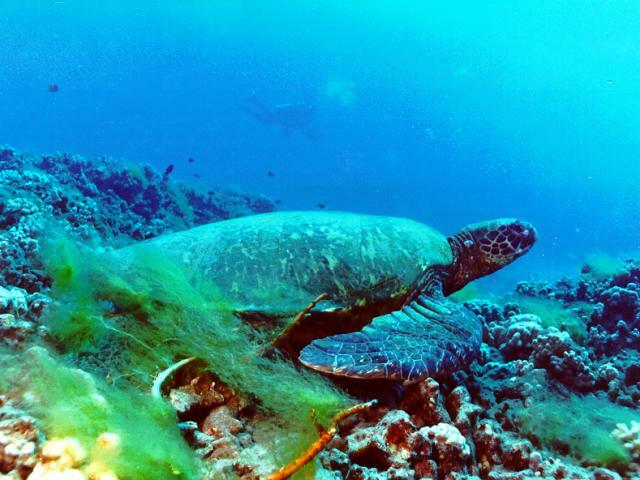 George Balazs has estimated that Hawaiian green sea turtles take 25 years to reach maturity. If this is indeed the case, it is possible that Tiamat burst out of the sand as a hatchling back in the summer of 1973 when George first patrolled East Island for nesting sea turtles. We like to think that George could have "met" Ti's mama, or watched as the little hatchling Tiamat scrambled along the beach and into the Pacific. Turtles make humans marvel--instilling a sense of wonder and even awe. In 1996 we named Tiamat after a dragon in a children's book. Tiamat means "Queen of the Universe" and now, on this special silver anniversary year of the sea turtle tagging programme as French Frigate Shoals, this is indeed a fitting name for this sweet beautiful honu. At Honokowai we have four other tagged females. All were here last summer taking time off from their reproductive duties. These turtles include Tutu (U 521), whom we’ve known since 1990; McTaggert (F 765), known since 1992; Mendelbrot (U 359), known since 1993; and Shredder (A 240), known since 1995. As of Friday July 3rd, only one of the four (Tutu) has been sighted. On the evening of June 29th, we received a message on our answering machine. Mendelbrot, a turtle we have known since 1993, was sighted on East Island laying her eggs. She is U 359 and the good people monitoring turtles there this season took a picture of her. George Balazs said he will send the photo to us to post on Turtle Trax the moment he receives it. This makes Mendelbrot the first Honokowai turtle for which we will have a photographic history in both nesting and foraging habitat. If all goes well we might see Mendelbrot as she returns to Honokowai at the very end of August. If that happens, we'll celebrate and let you know. As always, we are indebted to George Balazs for his kindness and support of us. At time of writing we have identified 32 turtles, of which 15 have been sighted in either 1997 or 1996. This represents a minimum of resights because we did not bring or photo id's from 1989 to 1995.